The first we hear of Harry (or Henry) Phillips is in 1789 when he married Sarah Mitchell at St Martin’s in the Field, but the first auction under his own name took place only in 1796. 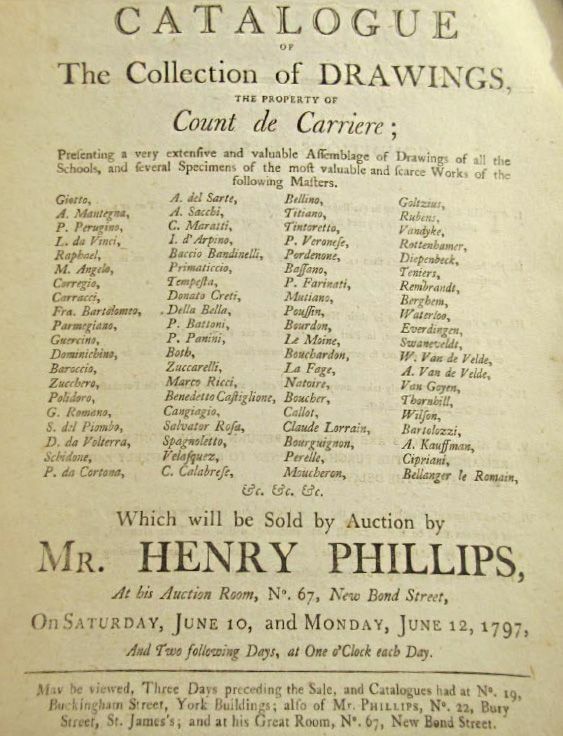 The Getty Provenance Index suggests he did not yet have his own auction room at the beginning of his career, as they list an auction in June 1796 for Harry that was conducted at the Great Room, Saville Row. This auction room belonged to a Mr. Squibb and was used by several other auctioneers as well, so definitely not Phillips’s property. There is a suggestion that he worked for James Christie before setting out on his own, and although the records of Christies for that period are no longer extant, circumstantial evidence is available. On 24 May 1796, an advertisement in the True Briton is headed “No. 67, New Bond Street”, with the actual auction to be held “by Mr. Christie, at his Great Room in Pall Mall”. On 12 January 1797, so half a year later, an auction is held by “Mr. H. Phillips, at his Great Room, 67 New Bond Street”. Neither Christie nor Phillips appears in the tax records for the late 1790s, so they must have rented, rather than owned, the property. It is only in 1804 that Phillips’s name appears in the tax records for New Bond Street. Did Christie hand over one of his sale rooms to his former servant? Possibly, but difficult to prove, unless someone can dig up more evidence. But the New Bond Street address is not mentioned in every advertisement. 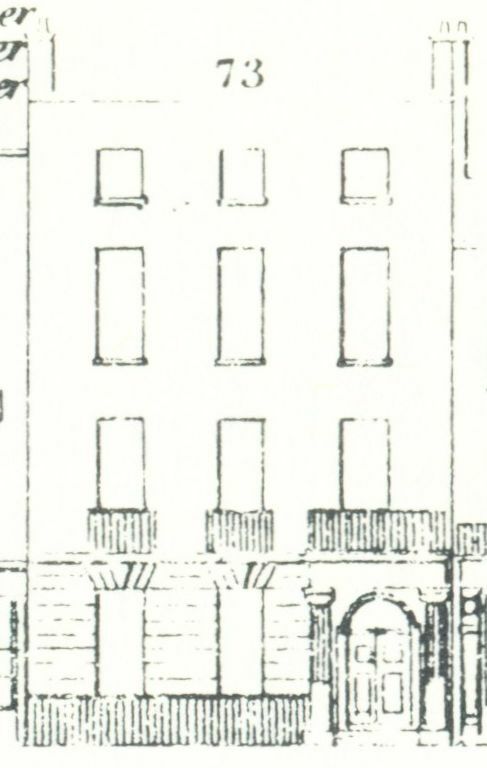 One in the True Briton of 5 January of 1797 announces the sale of a lease and elegant furniture of a property on the west side of St. James’s Street. 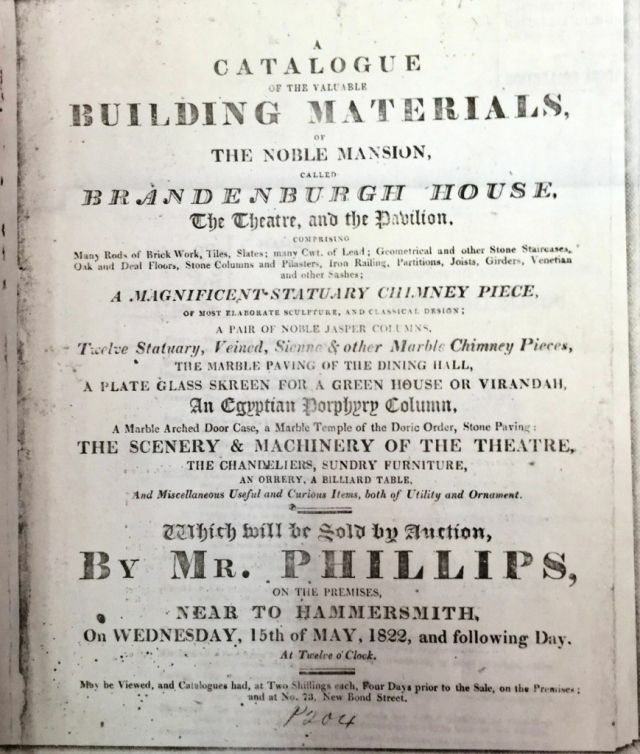 Catalogues were to be had on the premises and at Phillips’s, 22 Bury Street, St. James’s. No mention of New Bond Street. 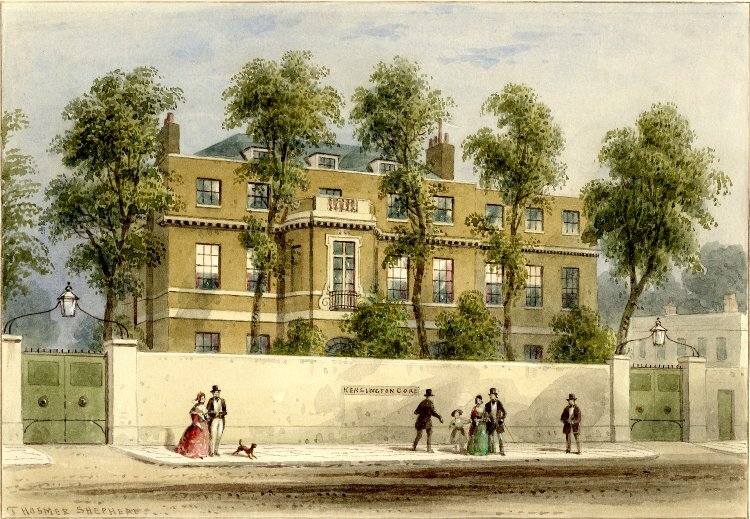 But in June that same year, Phillips announces no less than three sales at his “Great Room”, 67 New Bond Street: one for ancient and modern drawings, the second for plate, jewels, wine, and liqueurs, and the third for the library of a gentleman. (1) Although he is now definitely dealing from New Bond Street, the Bury Street premises are still listed, so not a complete move, but rather an expansion. It is not clear how long he had been at Bury Street, as no advertisements have come to light for Phillips prior to 1797. The first of these June 1797 auctions, the one for drawings, was part of a large sale over several days of the collection of Count de Carriere, which was “likely a pseudonym for exiled French count Etienne Bourgevin Vialart”, according to the Getty blog post “British Art Auctions at the End of the 18th Century” (see here). They also show a page of a 1798 annotated sale catalogue of Phillips. The house numbering in New Bond Street changed around the year 1805 and up to 1808 some advertisements for Phillips’s business described his address as “68 or 73 New Bond Street”. By then, he not only auctioned paintings and drawings, but also sold houses, as can, for instance, be seen in an advertisement in The Morning Chronicle of 22 October 1807 where he announces the sale of a leasehold property in Russell Place, which was to be sold “by private contract” and particulars could be seen at Mr. Phillips’s Estate and Auction Office. 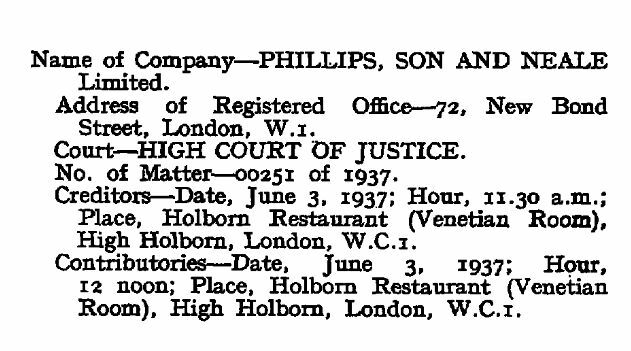 In this advertisement he already called himself Mr., which was to be his usual designation throughout the rest of his career and long after, as his son continued to name the business Mr. Phillips’s. In 1806 Harry married a second time, to Frances Mary Goldicutt at St. Mary’s, Whitechapel, but he also had a mistress, Elizabeth Cauty, with whom he had several children. After Harry’s death, she married Henry Artaria, a former employee of Phillips, and after Artaria’s death, she became the wife of John Smith, the art dealer and historian. Although the official address for the auction rooms was 73 New Bond Street (formerly number 68), number 72 (67) was also occupied by Phillips. It is not always clear from the tax records how the division between 72 and 73 was administered, as we frequently find another name as the occupant of number 72 in the records. Tallis has G. Perry & Co, lustre makers at number 72. It is likely that Phillips used the building at the back of the house and rented out the front part of number 72. Or alternatively, that he rented space from whoever owned number 72. 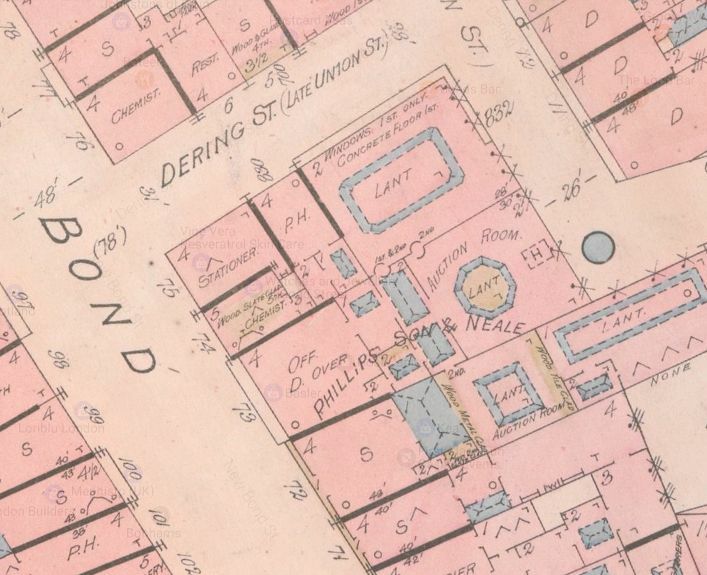 Goad’s insurance map certainly indicates that the auction rooms were situated at number 73 and in the buildings behind numbers 72 and 73. 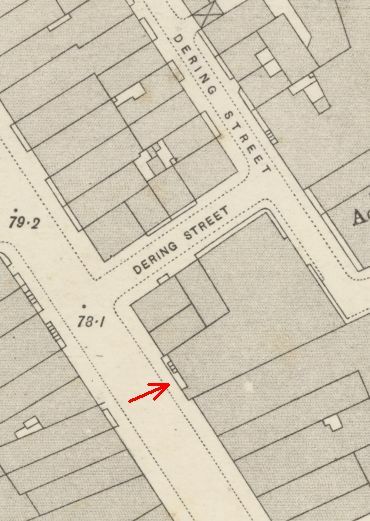 And the Ordinance Survey map of 1895 shows one large building which even included the corner property at the back in Dering Street. So much for the auction business, but if we return to Harry Phillips himself, there is a bit of a mystery. Where did he come from? According to his will, Harry had two sisters, Jane Phillips and Elizabeth Thompson. No conclusive evidence has been found of his birth or baptism, despite the efforts of Jeremy Lever and Robert Phillips who have been looking into the family history, and to whom I am most grateful for sending me lots of information on Phillips. There may be a link between Harry the auctioneer and Thomas Phillips, an artist, as at one point Harry stored some furniture at 8 George Street, where Thomas lived from 1804 till his death in 1845. (7) However, there are at least two other explanations besides a family relationship possible: the identical surnames of the gentlemen is just be a coincidence; or, the Old Bailey record did nor enter the house number correctly, as in 1818, Phillips takes out an insurance on 28 George Street, so was 8 perhaps a mistake for 28 and was there no link at all between Harry and Thomas? If you have any suggestions as to Harry’s origins, please leave a comment. (1) Oracle and Public Advertiser, 14 June 1797. (4) Thanks go to Robert Phillips for sending me this reference. (5) See Chapter 24 in Nick Foulkes, Last of the Dandies: The Scandalous Life and Escapades of Count D’Orsay, 2014 here). (6) ‘The 12-year-old auctioneers established 1796’ by David Blundy in The Sunday Times, 24 September 1972. (7) Old Bailey case t18130602-5.